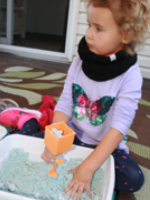 Children always enjoy sensory bins. 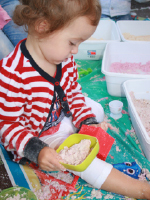 Since they especially like playing with wet sand, here is a recipe for homemade moon sand. 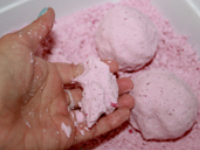 Its texture is very close to the texture of wet sand and it is perfectly safe for little hands. I prepared 6 containers of homemade moon sand. Each one contained 4 cups of moon sand. 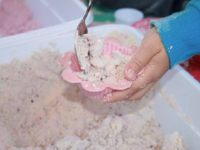 Feel free to prepare one large container of homemade moon sand by doubling or even tripling the recipe. 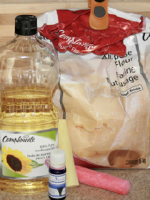 Simply mix the flour and oil together. At first, the flour will not stick. Keep mixing until the mixture looks a lot like wet sand. Its texture must make shaping loose balls of moon sand possible. 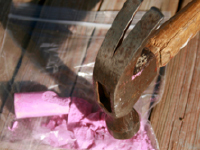 To make colourful moon sand, simply drop a piece of sidewalk chalk in a Ziploc bag and use a hammer to crush it. 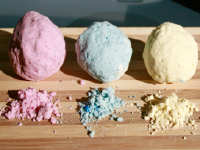 You will end up with a colourful powder-like dust. Add it to your prepared moon sand. I divided my moon sand into six containers and chose to add color to four of them. I did not add color to two containers that I set aside for the youngest children to manipulate. I added a few drops of lavender oil to one container. I must say that the moon sand in this container smelled very good. Adding a different essential oil to each container may be interesting. Since preparing my homemade moon sand required less than a bag of flour ($7) and 3 cups of oil, we can conclude that it is economical. What's more, it looks almost exactly like the moon sand sold in big-box stores. 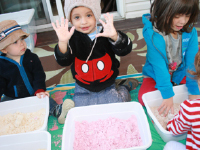 I tested my homemade moon sand in a home-based daycare, with Isabelle's group. As I always do, I began by inviting children to explore the contents of the containers with their hands, without offering any accessories. My goal was to provide children with the opportunity to explore the texture. A few minutes later, I added different kitchen tools. 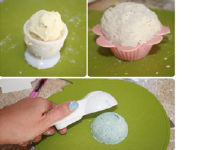 I provided a spoon, a small container, a muffin mould, an eggcup, and an ice cream scoop. Of course, spatulas, small bowls, and ladles would also be interesting additions. 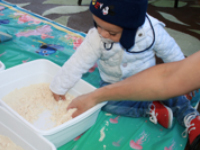 Since homemade moon sand is prepared with flour and oil, it can safely be manipulated by babies and toddlers. If necessary, give children their pacifier. Of course, supervise children throughout this activity. I had set a plastic tablecloth on the ground and placed my moon sand containers on top. Children had a lot of fun manipulating the moon sand, sitting directly on the ground. We simply let them explore the moon sand freely. The flour does tend to spread and adhere to children's clothing. I was somewhat worried that cleaning up would be difficult. In the end, we simply brushed children off using a damp facecloth and sent them to play in the yard as we finished tidying up. Much to my surprise, any flour remaining on children's clothes simply fell off as they played. We vacuumed around the area where the containers had been. As long as your flooring is not porous or doesn't contain holes, the flour is easy to remove. I decided to let the entire group manipulate the moon sand at the same time since we were two early childhood educators to clean up afterwards. 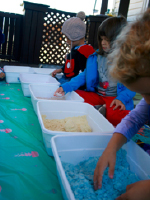 This activity can also be presented as a workshop, letting one or two children explore the moon sand at a time. 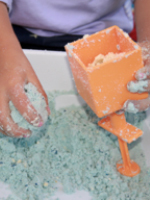 If you place the moon sand containers on a table, at children's level, cleanup should be quick and simple. Thank you to Isabelle for letting me test my moon sand recipe with her group.